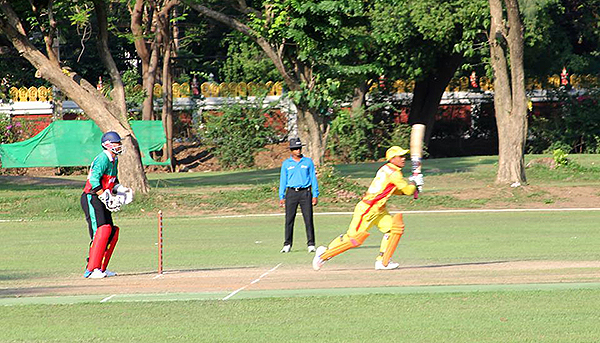 Bhutan suffered yet another defeat in the ongoing ICC World Cricket League Division One Asia Qualifier in Thailand. This time, at the hands of Kuwait, today. Overnight thunderstorm led to wet ground conditions, resulting in the match being reduced to 24 overs per side. Bhutan won the toss and elected to field first. The plan to field first seemed to be working well when Bhutan’s Tenzin Wangchuk removed Kuwait’s opening batsman Mohammed Asghar for a golden duck in his first over. However, a 53 run second wicket partnership broke the early momentum Bhutan had. Kuwait raced to a total of 179 runs for the loss of nine wickets. Suprit Pradhan being the pick of Bhutanese bowlers with four wickets. Bhutan’s chase was nothing short of what was already a poor batting performance in the tournament. Despite Suprit Pradhan and Captain Damber Gurung’s efforts with the bat, Bhutan could only manage 104 runs before running out of overs to bat with. The Bhutanese men will look to salvage some pride when they play their final match of the tournament against Bahrain on Monday.